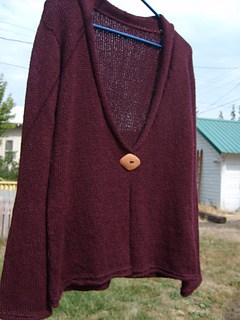 Knit in one piece, with sleeves worked in the round from shoulder to cuff, it requires almost no sewing. Starting at the bottom edge, the stocking stitch does its own thing and creates a rolled body and cuff hem. The collar is worked in reverse stocking stitch for extra emphasis and texture. Dress it up, dress it down, take it on the town, we guarantee you will love this one, as well as the many options it provides. This single button jacket is worked in one piece with shoulder seams and a slightly fitted waist. Collar is worked in reverse Stocking stitch and rolls naturally. You may want to make this in more than one color when you discover how indispensable it is.